"This dressing is the closest thing I could come to perfection. 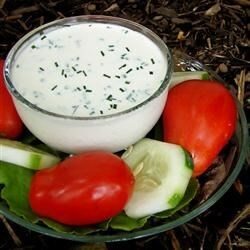 Enjoy it on salads and baked potatoes or use it as a dip for vegetables." Whisk together the buttermilk, mayonnaise, and sour cream in a bowl. Stir in the garlic powder, onion powder, chives, dill, parsley, salt, and pepper. Cover and refrigerate at least 30 minutes before serving. Not the best ranch dressing I have made. Just OK. Too thick; I should of thinned it out like some others mentioned. If you are looking for restaurant style ranch, this is not it. This is really good. I added just a little basil. Way better than my regular recipe. And, it makes a lot, too! Use fresh spices. You'll be amazed at the difference. This is a great base for all kinds of dressings you can change it by adding blue cheese, parm cheese, horse radish, dill pickle cubes the list is endless. Thanks for a great base dressing!